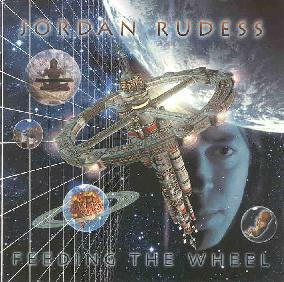 Jordan Rudess - "Feeding The Wheel"
You would expect, on a solo outing, that the keyboardist for Dream Theater, Liquid Tension Experiment, and formerly The Dixie Dregs would produce an album of instrumental fusion and progressive metal with an emphasis on the keyboards. And that's exactly what Rudess delivers on Feeding the Wheel, though he is creative enough to include more than just a few surprises. Rudess's fingers seem made of vapour as they dance effortlessly across the keyboard, and it's this unbridled virtuosity coupled with the ease at which he seems to play that give the music, otherwise part of a sometimes tired genre, an air of freshness and exuberance. Rudess bounces between classical licks, jazz and swing improvisations, and full out rock, often within the same song, such as the 11-minute Quantum Soup which opens the album after a very brief spoken word intro. The song somehow manages to take all these disparate elements and fuse them together in a totally natural way. Rudess shows off his softer side on the gentle Shifting Sands, which avoids the usual sand trap of being simply a ballad without words, by including touches of Japanese melody and a stirring guitar solo by his Dixie Dregs mate, Steve Morse. The upbeat Dreaming in Titanium is brimming over with cool metallic and bell-like effects that make it one of the best tracks on the album. Ucan Icon is a darker piece, with heavy guitars provided by John Petrucci of Dream Theater, but still has time for some complex keyboard sequences. Center of the Sphere is a short but effective electronic piece and is a nice lead-in to Crack the Meter, which showcases some sizzling bass-work by Billy Sheehan and excellent drumming from ex-Zappa drummer Terry Bozzio (who provides percussion throughout the album). Headspace, another ballad, is less effective than Shifting Sands, though does sport some nice swirling electronics and piano. Revolving Door is an 8 ½-minute track, with some amazing orchestral keyboards and wild synthesizer solos. Rudess really shines on this piece. Interstices is the real surprise or the album, a gorgeous piece played entirely solo on the grand piano. It's for the most part in a classical style, but delves into jazzy breaks now and then. Feed the Wheel is a strong rocker to finish the album off (musically, anyway-more on that in a moment), with lots of varied and interesting bits. It's unfortunately marred by a brief turn of yelled rapping. Where that came from is hard to say, and equally mystifying is the last little bit of the album. The album closes on an odd and totally unnecessary note with some bizarre spoken word nonsense about being a slave to the wheel, that tries to tie the titles of the songs together into some kind of cosmology. It doesn't work, unfortunately. I would have preferred something a little briefer, like the intro, but since it's at the very end, it can be ignored or skipped over. A few questionable production choices do not, however, undermine Rudess' talent in both playing and composition. Feeding the Wheel is an album that will not only appeal to fans of the bands Rudess plays in, but to anyone looking for something fresh and exciting in instrumental progressive rock. For more information you can visit the Jordan Rudess web site at: http://www.jordanrudess.com/. Feeding The Wheels is distributed by Magna Carta. You can visit their web site at: http://magnacarta.net. Contact via snail mail c/o Magna Carta; PMB 1820; 208 East 51st St; New York, NY 10022-6500.